I totally love this wedding cake. And I get to see a lot of beautiful cakes! 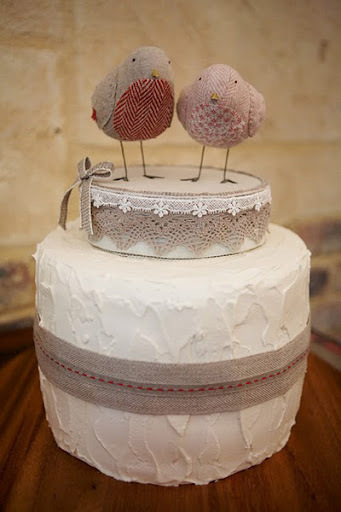 This cake is from the wedding of talented textile designer Danielle Stewart (Danielle Stewart Design, formally Danielle Smeets/Of Paper And Thread). Danielle's Mum made the cake, Danielle decorated it with gorgeous ribbons and the darling cake topper was made by Ashley Anna Brown. Danielle totally embraced the handmade ethic throughout her wedding including gorgeous paper garland hearts from Little Jane St, invitations from Poppies For Grace, and divine linen tea towels hand screen-printed with her own design that she made for guests. For more images of Danielle's wedding, including an interview and wedding tutorials for paper cones and tissue paper poms, check out Wedding Ideas Australia. This is so cute and original, would love to see the rest of there wedding day!